No, they are not made of Chocolate. The story goes that many years ago, two giants threw stones and sand at each other and their fight lasted for days. Finally, exhausted, they made friends and left the island but the mess they made remains as Chocolate Hills. There is yet another native legend, the tale of Arogo, a young and strong giant who was handsome and though a favorite among female giants was a loner and spent time pondering and watching the night pass by near the river. Arogo fell in love with a native girl called Aluya with black hair. When news reached Arogo that Aluya would soon marry a man of her parents' choice Arogo kidnapped Aluya. Aluya was a mortal and died in the giant's cave. Arogo cried for months and the bitter tears of Arogo, after Aluya died turned into hills, a lasting proof of his love and grief. After sometime, Arogo's tears hardened and became what we know today as Chocolate hills, a witness of unrequited love of the years. There is no consensus among geologists about how these were formed till day, although some opine that these hills are weathered formations of a kind of a marine limestone on top of an impermeable layer of clay. These are geomorphologic structure known as a 'mogote'. Each hill is called a 'karst' which consists of limestone and is covered with topsoil and grass. This topographic Karst is formed when layers of soluble bedrock, are eroded by a process called dissolution. The unique shape of the mountains is also because of the erosion of the surrounding farmland that has led to the formation of underground springs, rivers and caves. A movement of tectonic activity might have also given the shape and structure to these hills. There are marine deposits like coral, algae, and mollusks in these hills. The hills have massive and towering domes, perfectly round. In fact, it is difficult to believe that they are not man-made. They appear too perfect to be the produce of time and erosion. The world renowned flagship tourist destination of Bohol, the cone shaped Chocolate Hills resemble a small child's sketches, but these are not man-made artifact but natural wonders. They are Nature's expression of beauty, mystery and romance. Located in the Bohol Province, Philippines, they consist of 1268 hills spread over 50 square kilometers which are interestingly uniform in shape and range between 30 and 50 meters tall. They are distributed over 18 miles in the towns of Butuan, Sabayon, Bilar, Sierra, Bollones, Valencia and Carmen. Covered with grass, these hills turn chocolate brown during the dry season and hence the name 'Chocolate' Hills. At other times, they are green and it may be a bit difficult for the tourist to associate with the name. The giant chocolate-like Hills form a rolling terrain of haycock hills. A famous attraction featured as prime tourist destination in the Philippines, Bohol's Chocolate Hills is a signature featured in the provincial flag and seal to symbolize the abundance of natural attractions in the province. They have been declared as the country's third National Geological Monument in 1998 and UNESCO has also declared these hills as a World Heritage Site. Yet, despite efforts by the government, these hills are used by many locals as a viable site for quarrying. Bohol is a small island and is ideal for touring on motorbikes and scooters which can be rented in Tagbilaran or Panglao. Pension houses can be seen along the market towns and people here are surprised and happy and share a taste of local Boholan lifestyle, much simpler and less costly than the resorts. 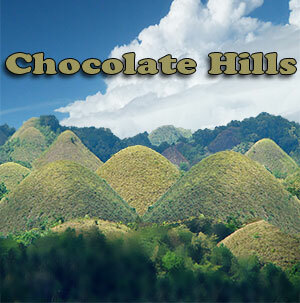 The Chocolate Hills are an amazing site, with giant grass-covered, dome shaped mounds. It is awesome to see the grass-covered limestone' looming in stark contrast to the flat rice paddy lands around them. Bohol is accessible via air and sea links from Manila and nearby Cebu. From the Island capital of Tagbilaran, you can reach the integrated Bus Terminal in Dao and ride a bus headed for Carmen. From Manila, you can fly to Tagbilaran airport, Philippines airlines or Cebu Pacific airlines offer direct flights. You can also travel through the Visayas, with frequent ferries running between Cebu city and Tagbilaran. Buses and taxis go to the interior of the island in a few hours depending upon the route. On return, it is from Carmen to Tagbilaran. Alternatively, motorcycles are available for tourists to ride 'habal-habal' or take a taxi. A few buses also ply to Carmen. For travel within the area, you can try public buses, cabs and taxis. You can either choose to go with a tourist guide or customize your own tour. On the main island of Bohol, you can find the Church of Our Lady of the Immaculate Conception in the municipality of Baclayon. The original structure was said to be constructed around 1595. Its stained glass windows and checkered floors are reminiscent of an earlier time. There is a small museum of religious artifacts nearby. Take the Loboc River Cruise to slowly glide through the tree-lined route of the Loboc River. You can catch low waterfalls, floating bamboo decks and a mini sanctuary for tarsiers, tiny nocturnal primates. 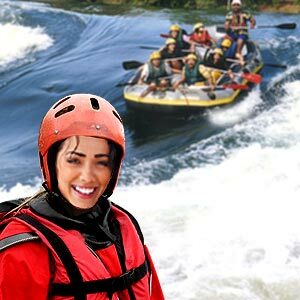 If you take the Countryside Tour with a guide, you will see the Butterfly Garden, Tarsier Park and have lunch on the floating boat along the river. 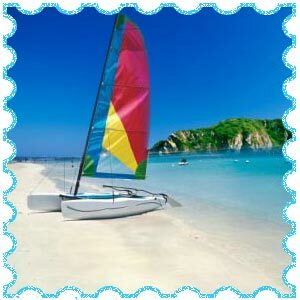 You can check out the snorkeling and skin diving activities. For those who wish to stay at the Chocolate Hills, there was a Government run Chocolate Hill resort facility which was severely damaged by the earthquake and hence closed. For economical accommodation, small hotels and guest houses can be found in and around Carmen and Sagbayan. A restaurant, resort and a view deck have been built on two of the area's highest hills for the tourists. This complex is located in Carmen town. This includes an air conditioned restaurant, souvenir shop, and a hotel. The more recent one in Sabayan is called the Sabayan Peak. This is the other way to view Chocolate Hills, from a mountain resort in Sabayan town about 75 km northwest of Tagbilaran City. An unobstructed view of the Hills can be had from this deck. Situated on the mountain top is a 12 acre resort and recreation center and its viewing offers a 360 degree perspective of the Chocolate Hills and the blue sea that separates Bohol and Cebu. Although viewing the Chocolate Hills from the observation deck is interesting, nothing beats zipping on trails between the hills on an all-terrain vehicle. 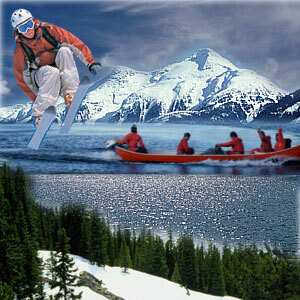 Packages including guides will lead the discerning traveler through a number of suggested trails. First Published Date: 18 Sep 2014 Last modified Date: April 22 2019 This page may have been updated recently as new information is available or the content may have been edited for better readability.